The Parasol microsatellite, launched on 18 December 2004, has successfully completed in-orbit commissioning after several weeks of tests during which all instruments were switched on and validated. It is now set to begin its mission to observe clouds and aerosols. The second in CNES’s Myriade microsatellite series, Parasol has been in orbit for barely 3 months. In that time, teams at the Toulouse Space Centre have positioned the satellite, distributed its 1st pictures and made orbit corrections to take it into position alongside its companion satellites in the A-Train. The in-orbit commissioning phase is vital to assess system performance and ensure that everything is working properly. Parasol has checked out with a clean bill of health, the ground component is up and running, and all functions in the chain—from satellite tasking to image delivery—have been validated. From now until June, mission teams will be doing additional calibration tasks to enhance image quality. But Parasol is already performing as expected and providing imagery comparable to that acquired by the Polder 2 instrument. Parasol will help scientists to get a closer look at the physical and micro-physical properties of clouds and aerosols. Understanding the role of aerosols in climate mechanisms, how cloud cover responds to global warming, and how clouds and aerosols interact are just some of the mission’s goals. 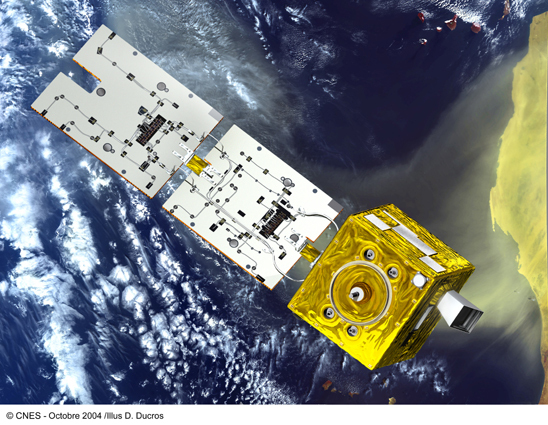 Parasol was developed by CNES with support from CNRS, the French national scientific research centre. CNES also designed the satellite command-control infrastructure on the ground. Now in its final operating orbit, Parasol is ready to begin its mission as part of the A-Train space observatory dedicated to studying climate, which ultimately will comprise 6 French-U.S. satellites. Parasol’s mission is scheduled to last 2 years. Operations teams have now taken over responsibility for the satellite and are working toward the next milestone on 4 April, when science data products will be made available to users.